The exciting part is that To can now trial since in Slovenia, the limit for A1 (jumps on 55cm) is 15 months. The bad part is that A1 starts at 8am - and A3 at 2pm, meaning I now have to be at the trial from 8am to 8pm and get up way earlier as I like to. So everybody who knows how much I appreciate to sleep long will understand how VERY motivated I am to get out of A1. - This is just to explain why I'm hardly moving by the end of our agility run, hoping we can keep those bars up 🙂 - And we did it!!! 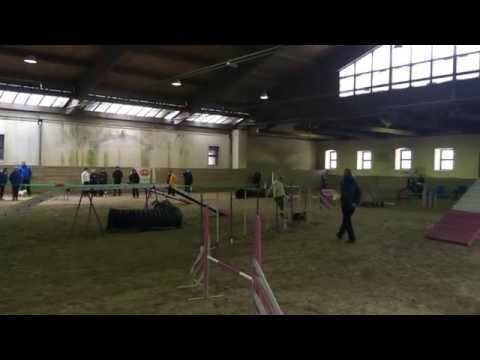 After 1st competition, we're already 1/3 into A2 and she even won overall, even though in jumping, we had one bar and a refusal on a chute (ooops, looks like I forgot to train something - sorry To - she is too funny when she goes looking for "real" tunnels when I send her back with a tunnel cue!). She was much slower as at home though, but the good thing about it is that she is knocking less at that speed so we will try to stay slow till A3 🙂 We still had best time and speed 5,37m/s, so I guess that's fast enough for now! Our next trial is only end of March, looking forward to it! The others did great as well, Le and Bu won Slovenian Winter Cup and Bi was great again as well, but I crashed into one jump, oops - I guess getting up early is bad for me! - So To, make sure to keep running like this till A3!! !